2019 began with the United States’ longest government shut down ever, halting the work of many federal agencies and leaving analysts especially concerned for the Nation’s cyber security. According to The Hill, Lawmakers are experiencing growing concerns that the “lingering effects” of the government shutdown, coupled with increased efforts from hostile foreign actors, have left the United States vulnerable to cyber threats. 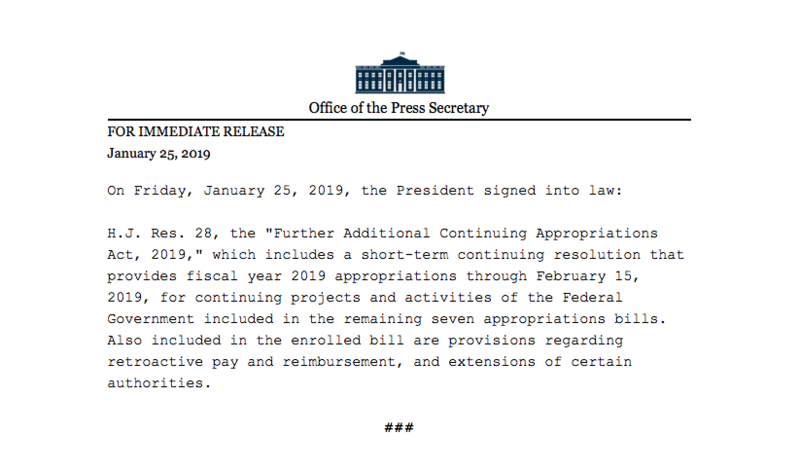 During the shutdown, the Department of Homeland Security (DHS), one of the agencies forced to furlough certain employees, issued a first of its kind emergency directive detailing what procedures were to be followed as a result of the lapse in appropriations. House Homeland Security Committee Chairman Bennie Thompson told the Hill that another shutdown “absolutely” could amount to “an open invitation for foreign hackers to go after federal systems,” further explaining that Congress’s “concern is that so many of those persons we relied on, they weren’t there,” Thompson said. “And that makes us weak.” Currently DHS has temporary funding until February 15th, 2019 at which point the government will face the specter of another shutdown. DHS was not the only Federal agency whose cybersecurity operations were affected by the shutdown. According to a 72 page briefing from the FBI Agents Association, an organization founded in 1981 to protect the rights of FBI agents and former agents, the FBI cyber investigations and enforcement efforts were seriously affected by the shutdown. The report, titled “Voices from the Field: FBI Agent Accounts of the Real Consequences of the Government Shutdown”, focused on how several areas of the Bureau’s efforts were adversely impacted by the shutdown. The report included many quotes from acting FBI agents, identified only by the region they operate in, and shed light on how the shutdown put many types of operations in jeopardy. These include making payments to confidential human sources, funding for wiretaps, issuing subpoenas, and collaborating with other federal agencies that were likewise unfunded and facing furlough. The Federal government effectively pushed back the deadline for reaching a budget agreement until February, 15th, 2019. It is unclear as to whether or not the President and Congress will reach an agreement, or if another shutdown is already in the making. In the meantime, it appears that US cyber resilience is being pushed closer and closer to its limits.